Do you hate having your noisy fans spinning full blast when all you're doing is checking your email? AeroCool puts the power of silence at your fingertips with their new V12XT touchscreen fan controller! 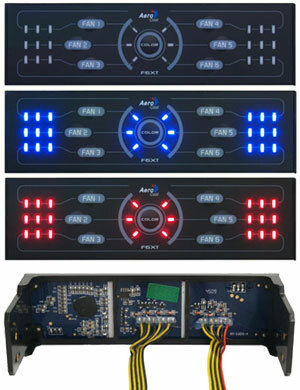 Featuring adjustable backlighting (Red, Blue, Off) and 3 individual speed settings for up to 6 channels of fans, the F6XT will help you find the ideal balance between safety and sanity!